Science’s warnings about a warming Earth are getting sharper as each year brings new shocks. The Turnbull government must be on another planet. How do we feel about winter bushfires every year? That’s the sort of question we need to ask ourselves in light of what recent scientific papers say about the trajectory of global warming. Eight months after a midwinter wildfire destroyed homes in Los Angeles, last week in the depths of a southern winter scores of fires erupted in coastal lands from Queensland to southern NSW. Big August blazes are rare in NSW records; I could find just one, in the Hunter Valley in 1996. Two weeks earlier, NSW had sent fire crews to California, now at the height of summer, to help fight record-breaking conflagrations there. It’s not beyond imagining that at some point our two countries’ fire services will be unable to supply off-season help to the other. This northern summer is one of the hottest on record. It includes the world’s highest recorded daily minimum (42.6C, Quriyat, Oman), a record high temperature for Africa (51.3C, Ouargla, Algeria), and unprecedented 30C-plus temperatures, with forest fires, in Europe’s high Arctic. Jan van Oldenborgh and colleagues in the World Weather Attribution consortium found a strong human imprint on this summer’s European heatwave. And globally the next four years are set to see even more extreme heat, according to a statistical study published in Nature Communications. Reading what is now being said about our climate future in the context of unseasonal wildfire in both hemispheres, it’s hard to avoid apocalyptic thinking. Scientists’ fears cover a multitude of climate change symptoms, each one with huge ramifications for humanity. Melting permafrost is adding methane to the atmosphere. Marine life is feeling the heat – and acidity – in the ocean. Food production is threatened by rising sea levels and more extreme weather including drought and flood, adding to social chaos and threatening ecosystems and human health. I’m alarmed by what I read and see no point pretending otherwise. So is UK geographer Jem Bendell, who wrote this month that “a climate-induced form of economic and social collapse is now likely”. He says we should now focus on what he calls “deep adaptation”. A Nature paper in June looking at 50 years of rainstorms in Australia concludes they are set to become far more severe than anything previously experienced. Modelling projects yet more flash floods, especially in urban areas, and (unfortunately for food production) larger wet-dry extremes. Even more unsettling is a paper by a high-powered international team comprising lead author Will Steffen of the Australian National University and 15 others from the US and five European countries, published in late June by the National Academy of Sciences (US). The team is laden with decades of experience across all relevant scientific disciplines including earth system physics, chemistry and biology, ecosystem management, and the social and economic impact of climate change. Their analysis of the state of the climate is not to be taken lightly. The paper looked at the potential for self-reinforcing feedbacks pushing global climate across a threshold that – even if human emissions were reduced – could send it on a destabilised “Hothouse Earth” pathway, with temperatures 4C or 5C higher than at any time in the past 1.2 million years. The team concludes that even if humanity were to meet the Paris target of 2C of warming by 2100, other factors in play might already have set off a cascade of feedbacks before then. The paper reflects the group’s extensive experience in advising government and looking at practical aspects of applying science findings in the real world. It says that while the outlook is grim, a more stable climate is achievable and notes signs that a shift is already happening in this direction. A supporting discussion paper looks at possible solutions, pointing out the now-overwhelming need for “a coordinated, deliberate effort by human societies to manage our relationship with the rest of the Earth System”. “Stewardship of the entire Earth System” is what’s needed, says the paper, including things like “decarbonisation of the global economy, enhancement of biosphere carbon sinks, behavioural changes, technological innovations, new governance arrangements, and transformed social values”. This is a call to governments and citizens of the world to put aside all differences in a common cause. Saving as much as we can of our civil society, built out of centuries of struggle and pain, is surely worth almost any effort. Meanwhile, our government is trying to convince us that mitigating emissions is of no importance compared to lowering electricity prices and improving grid reliability, while former PM Tony Abbott wants Australia to build new coal power stations and renege on its Paris commitment. Such shocking ignorance could be remedied if government MPs chose. With parliament sitting this week, they could invite Canberra-based Steffen across Lake Burley Griffin to discuss his paper and remind them why rapid, decisive action to cut emissions is so important. If they feel the time Steffen spent on Julia Gillard’s Climate Commission makes him suspect if not an enemy, they could also invite along his boss, ANU vice-chancellor Brian Schmidt, who is a Nobel Prize-winning physicist. Surely they wouldn’t argue with him? Sadly, I think they would. To them, man-made climate change isn’t a physical reality so much as a matter of ideology, and nothing will convince them otherwise. 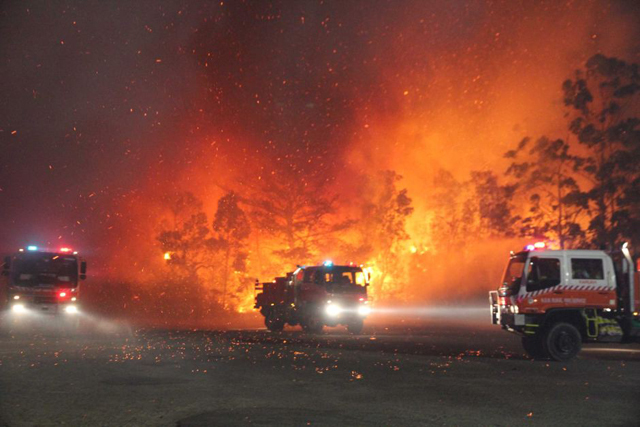 A winter fire-storm raging across Sydney might make them think twice, but probably not. This entry was posted in Adaptation, Australian politics, carbon emissions and targets, changes to climate, coal-fired, contrarians, economic threat from climate, leadership, marine organisms, renewable energy and tagged Brian Schmidt, Jan van Oldenborgh, Jem Bendell, Julia Gillard, Malcolm Turnbull, Tony Abbott, Will Steffen, World Weather Attribution. Bookmark the permalink.